Who can File Income Tax Returns(ITR) with ClearTax? Individuals having Income from Capital Gains (mutual funds & stocks), House Property, FD, Interest etc. Individuals who only have Salary income can file with or without Form-16. Individuals who have switched jobs during the financial year can file (Multiple Form-16). Individuals having Foreign Income (Onsite deputation), Foreign Assets, NRI. Avoid a maximum penalty of Rs 10,000, if your total income exceeds Rs 5 lakh. Taxpayers are often served notices from the IT department for delayed & missed return submissions. Your Tax Return documents are proof of your financial investments and will be useful when you apply for a loan or a visa. You can carry forward losses against house property and depreciation. You can claim tax refund; the earlier you file the sooner you will get the refund. Most embassies and consulates require you to submit IT returns for the last 3 years. Schedule a 45-minute phone call with ClearTax expert. *This plan includes only advisory and no filing happens in the purview of this plan. Whether you are a resident Indian or an NRI, filing an income tax return is compulsory, if your total Indian income exceeds Rs 2.5 lakh. Even if you don't meet this threshold, it's a good practice to file or e-file your income tax return. An income tax return is an important document you must produce at the time of availing a home loan, as it reflects your financial discipline and prosperity as well as shows your capacity to repay a loan. If you are planning to go abroad for higher studies, or are about to take up a job outside of India, you'll need at least three years' filed income tax returns to show as proof of income. People processing your visa application may request for your ITR documents to evaluate your financial health, which in return shows that you can support yourself on your own in their country. You can file your income tax returns online, either on the income tax department's website or with us on www.cleartax.in. Income Tax filing or e-filling is made easy on Cleartax.in. You can e-file your returns within just 7 minutes! Also note that the due date to e-file your income tax returns for the assessment year 2019-2020 is on or before July 31, 2019. What are the details you need when you're e-filing your income tax returns? - Produce basic information such as PAN, Aadhar Card, and current address. - Details about all the bank accounts you've held in the given financial year is mandatory. - Income proofs like current salary details, income from investments (like FDs, savings bank account) etc. - Information about all the deductions you've claimed under Section 80. - Tax payment information such as TDS and advance tax payments. Is it possible to file Tax Returns for financial years before 2014 online? No, you cannot file income tax returns online for years before 2014. From 2017-18 onwards, you can only e-file income tax return for 1 year. For example, you can e-file the income tax return for FY 2017-18 only up to 31 March, 2019. You can't file any returns for years passed. What’s the next step after you’ve e-filed your income tax return? Once you’ve filed your tax return online, you will see a 15-digit acknowledgement number on the screen confirming your submission. You must then verify your tax return, which you can do from your Netbanking accounts. For FY 2018-19, if your income exceeds Rs 2.5 lakh (Rs 3 lakh for those aged 60 years and above) you must file an income tax return in India. You must also file a tax return if excess TDS has been deducted and you want to claim a refund. Paper return or e-filing of income tax? If your income is greater than Rs 5 lakh, or you are seeking a refund, you must file your income tax return online. An exception is made when the individual taxpayer is 80 years or older. The documents needed to e-file your tax return will vary case to case. Note that the income tax return is an annexure-less form. This means that no supporting documents need to be sent along with your tax return. But do store them carefully. This will help in case the income tax department has any questions about your tax return. Sign up or login to www.cleartax.in with just your email account. ClearTax is simple, easy and free to e-file your Income Tax Return. Every company in India issues Form 16 for all its employees, typically in the last week of May and first two weeks of June. You may receive them in a PDF or get them as 2 seperate PDFs. Part A of the Form 16 contains all the details related TDS and the company’s TAN. Part B contains key information about allowances such HRA, LTA, your taxable salary, and deductions you’ve declared at the time of investment submission. All you have to do is upload them on ClearTax.com, and it will automatically read your income, deductions, TDS, and pre-fill your income tax return! Upload Form 16. If you don’t have a Form 16, you can still prepare a tax return with just a payslip. Claim missed out deductions and check if you have to pay tax. You can claim HRA, LIC premium and any other Section 80C expense or deduction you've missed. Medical reimbursements and LTA cannot be claimed. If you missed the investment submission proof deadline in office, then while e-filing your return on ClearTax, you can claim HRA, LIC premium, and any other Section 80C expense or deduction that you’ve missed to tell your company. This will lower your tax liability. Do note that medical reimbursements and LTA cannot be claimed. Read: What should you do if you’ve missed submitting investment submission proof deadline? Pay tax on the Department website if needed. The tax is calculated as you are filing your tax return. If you find that you need to pay additional tax, you must pay the tax first and then e-file your tax return. Both of these needs to be done before July 31st. If you don’t pay this tax before July 31st, you will be charged an interest amount of 1% per month (simple interest) on the tax amount outstanding. This interest will be calculated from the due date applicable to you for filing of return of the applicable year till the date that you actually file your income tax return. Read: How to pay tax online on the Department website? Double check all the details and e-file your income tax return. The deadline for filing your income tax return is July 31. A 15-digit acknowledgement number will be displayed on the screen. After you file your tax return online on ClearTax, you'll get a confirmation email from both ClearTax and the income tax department with the 15-digit acknowledgement number. Send ITR-V or e-verify your income tax return. Once the tax return is e-filed, you can send a 1-page acknowledgement to the income tax department in Bangalore or e-verify your tax return within 120 days from the date of e-filing. This can be done from most Net Banking accounts. Make sure you verify the tax returns, because returns that have not been verified are not processed by the tax department. The Income Tax Department is getting faster each year with processing your tax refunds. Taxpayers can expect to get their refund anywhere between just a couple of weeks to a few months. Track your refund right here on ClearTax. My company deducts the TDS. Do I still have to file my tax return? Yes, deducting TDS and filing a tax return are two different things. In fact, you file a tax return to show that you've paid all the tax you needed to pay. The income tax return is also a very useful document when it comes to applying for a loan or visa. 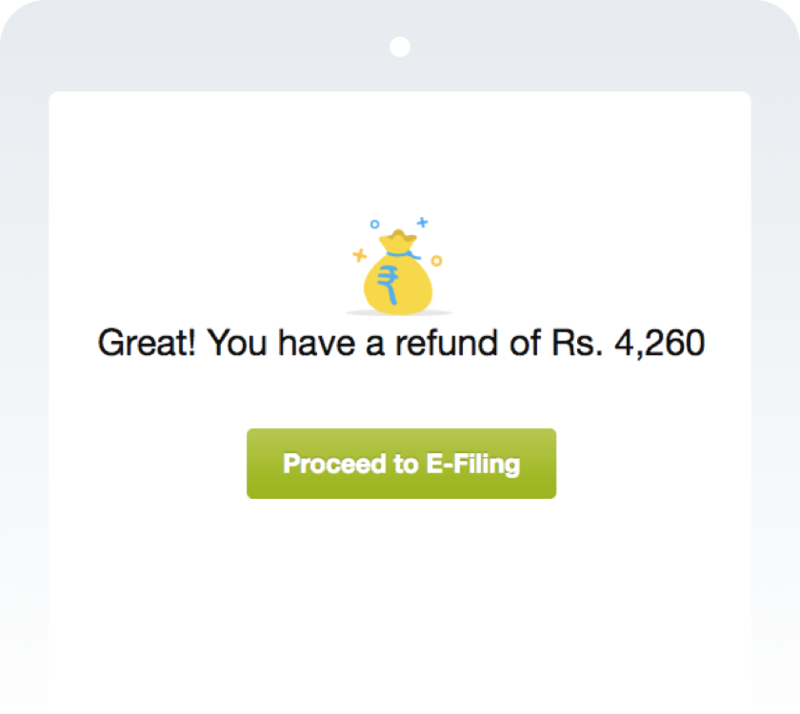 Which income tax return should I select for e-filing? Great question! There are nine forms - ITR 1, 2, 2A, 3, 4, 4S, 5, 6 and 7 for each type of tax situation. Honestly, choosing the correct income tax form is a lot of work. Which is why if you are e filing with ClearTax, we automatically decide the correct income tax return form. How do I pay tax to the government? You can pay tax to the government directly on the Income Tax Department website using your netbanking account with challan 280. Can I file income tax returns for years I missed? Yes, you can file income tax returns for the years you have missed. 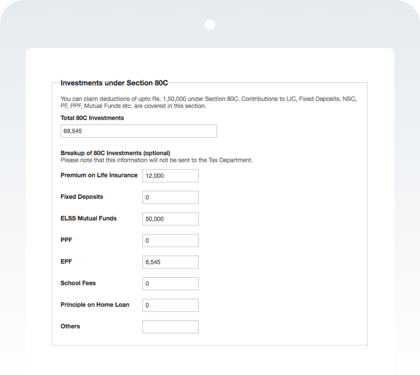 However, you can file previous year returns manually after contacting your Assessing Officer. For F.Y 2017-18, you can only e-file the income tax returns up to 31 March 2019. No past years' returns can be e-filed. .
ITR-V is a 1-page document that you receive after e-filing your income tax return. You must print, sign and send it to the Income Tax Department within 120 days from e-filing your tax return. I am a salaried individual and don't have a Form 16. How can I file my tax return? You can still file your tax return on ClearTax without a Form 16. You're just going to need your payslips. Follow the instructions on this guide to e-file without Form 16. Can I file ITR-1 with exempt agricultural income? You can file ITR 1 if the agricultural income is up to Rs 5,000. For agricultural income exceeding Rs 5,000, you have to file ITR 2.To know about ITR 2.Click here. Is it necessary to attach any documents along with the return of income? If I have paid excess tax, how will it be refunded to me? The excess tax paid can be claimed as refund by filing your Income-tax return. It will be refunded to you by crediting it in your bank account through ECS transfer. Don’t make mistakes in mentioning bank details such as account number,IFSC code etc in the ITR form. Is it necessary to file return of income when I don’t have any positive income? You must file your return before the due date, if you have sustained loss in the financial year and if you want to carry forward it to the subsequent year for adjustment against subsequent years positive income. Loss can be carried forward only if you have filed the return claiming such loss before the due date. Who can file tax return on ClearTax? c. Individuals having Income from Capital Gains (mutual funds & stocks), House Property, FD, Interest etc. Is it mandatory for me to do the ITR efiling or can someone else do it on my behalf? Economic Times ranks No.1 tax return filing website. The IT department has made it mandatory to link your Aadhaar number with your PAN card. NRIs are not subject to tax in India. But if they earn income in India, they will have to pay tax on it. Self-employed workers like freelancers, agents and consultants can claim costs directly related to the business as a tax-deductible expense. PF withdrawal before 5 years of continuous service is subject to tax. This will be taxed as salary income and as per the tax rate. Tax deductions under Section 80 are expenses and investments that help lower your taxable income. The lower your taxable income, the lower taxes you are going to pay. Capital gains tax depend on the type of asset and the period of holding. Tax is calculated differently for assets held for a longer period and for those held over a shorter period. If you've missed submitting your investment proofs, like LIC, PPF, ELSS or rent receipts, to the employer, you can still avail tax benefits on ClearTax and e-file your ITR. ClearTax automatically adjusts your TDS, advance tax paid and losses against your income and calculates taxes accordingly. Our ‘Form 16 Upload’ feature enables you to e-file your income tax returns within 7 minutes. You can file up to three tax returns for free from a single account. E-file income tax returns for your family members and have everyone's tax records in one place. Are you a business owner, F&O trader with a loss or a salaried individual? ClearTax automatically selects the relevant ITR form and helps you e-file seamlessly. ClearTax reads and automatically fills the details of the taxes paid from your 26AS. It gets downloaded in a PDF format. ClearTax is not just about e-filing your income tax return. We make sure that you don't pay more taxes than you have to. We help you save tax and invest. No more XML downloads, no more complicated password resets. Just sign up with your email account and e-file. Just upload your Form-16 and Cleartax will automatically capture the information and fill your tax return. Simple, right? File for many people from one account. You can file up to three tax returns for free from a single account. E-file income tax returns for your family and have everyone's record in one place. Fantastic support when you need help. 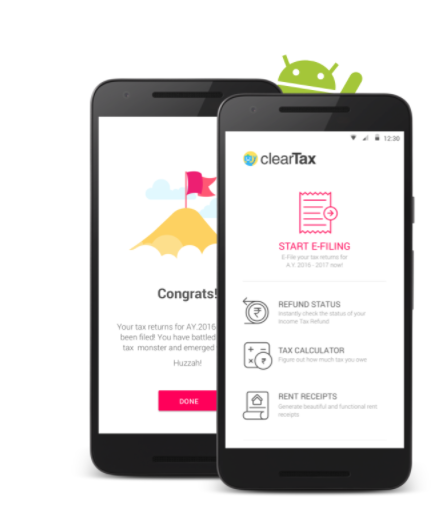 ClearTax's tax calculations are verified against the Income Tax Department's tax engine before e-filing to ensure that a return is being filed correctly. Our 128-bit SSL encryption and bank-grade security keeps your data safe. ClearTax automatically selects the correct ITR while you fill your info. We support ITR-1, 2A, 2, 3, 4S, 4, 5 and 6. Find an answer to any tax problems. ClearTax has 1000's of tax guides, videos, experts who answer your queries all day long. Data security is our top priority as a tax company. 128 Bit Bank Grade SSL. ISO 27001 Data Centers. Over 1000 CAs to help you. 24/7 support for resolution of your queries.